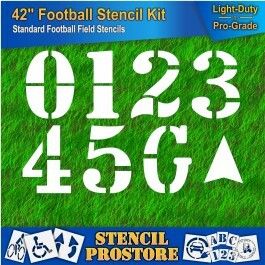 Athletic Marking - 42 inch - FOOTBALL FIELD NUMBER Stencils - (8 Piece) - 42" x 30"
RAE's 42 inch Football Field stencil is made from tough, flexible Low Density Polyethylene (LDPE) Plastic in either 1/8” (MAXI-LAST) thickness, or 1/16” (DURO-LAST) thickness. 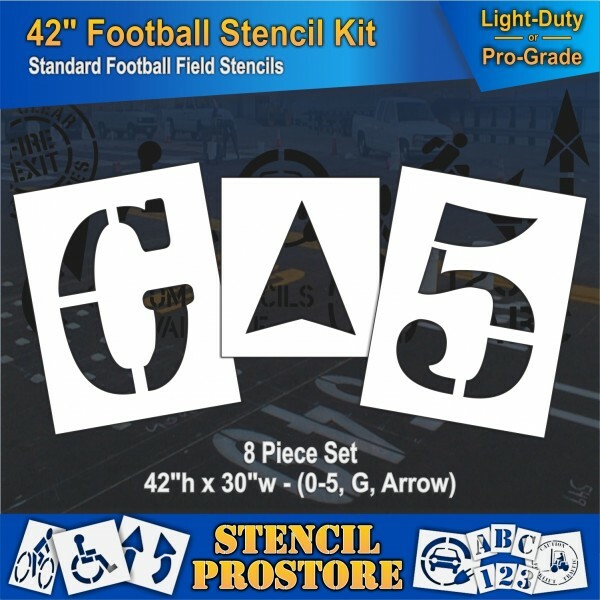 RAE's Pavement Marking Paint Stencils are made for parking lot and road marking applications to create a professional, clean looking painted symbol. 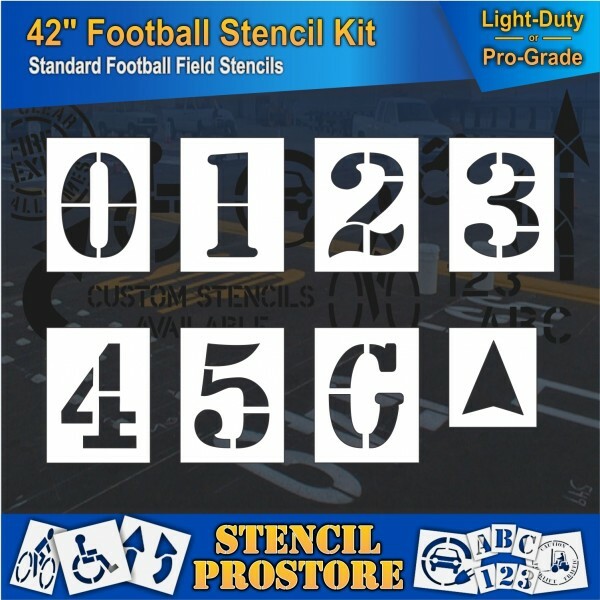 Use these stencils with a variety of liquid paints to designate parking and vehicle traffic directions in mutliple areas and applications. 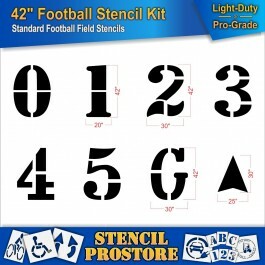 Made from reusable LDPE material, these stencils layout flat and are easily cleaned to be reused many times. 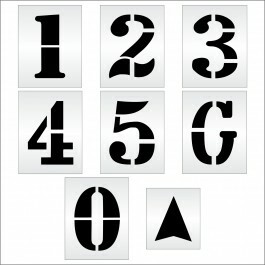 See our Material Description for more information. 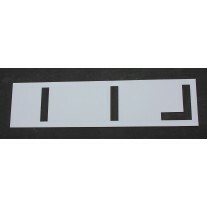 RAE manufactures 1000's of stencils - so if you don't see the one you're looking for, let us know, we can still make it! 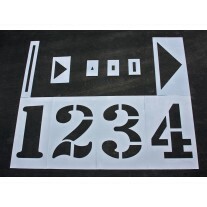 DESCRIPTION: RAE's Stencils are precision cut in tough & flexible Low Density Polyethylene (LDPE) Plastic. 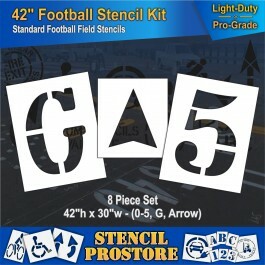 Flexible/Rollable for easy storage. 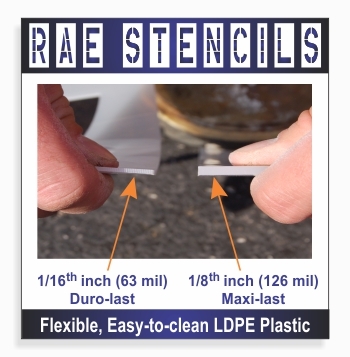 CLEANING: RAE stencils are easily cleaned by simply flexing the stencil to break the connection between paint and plastic. Once flexed, the dry paint peels right off. 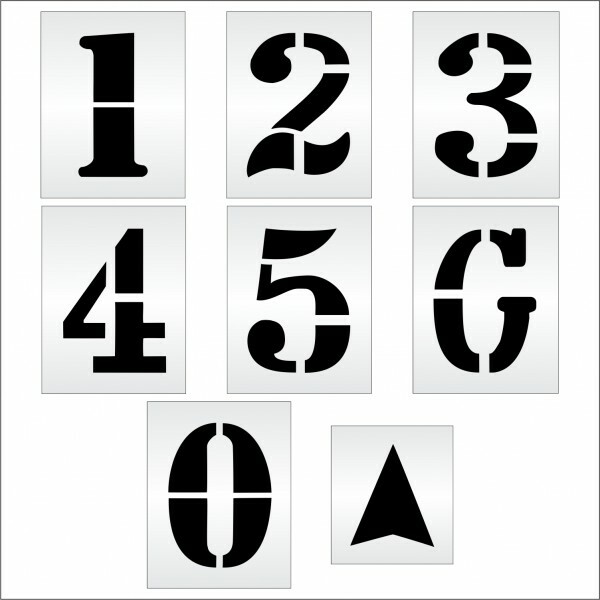 RAE Products’ stencils are REUSABLE and EASY-TO-CLEAN. Just let dry and bend, and the paint pops right off. Use over and over! 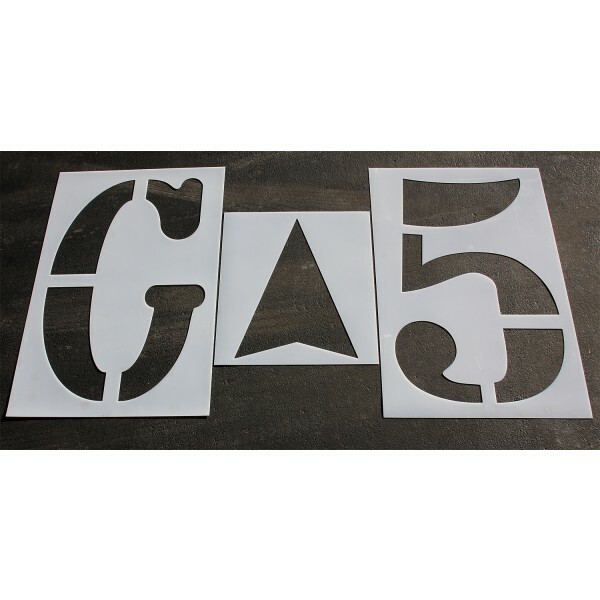 The stencil is made from Low Density Polyethylene (LDPE) Plastic and available in two different thicknesses - just pick the option to best suit your needs! 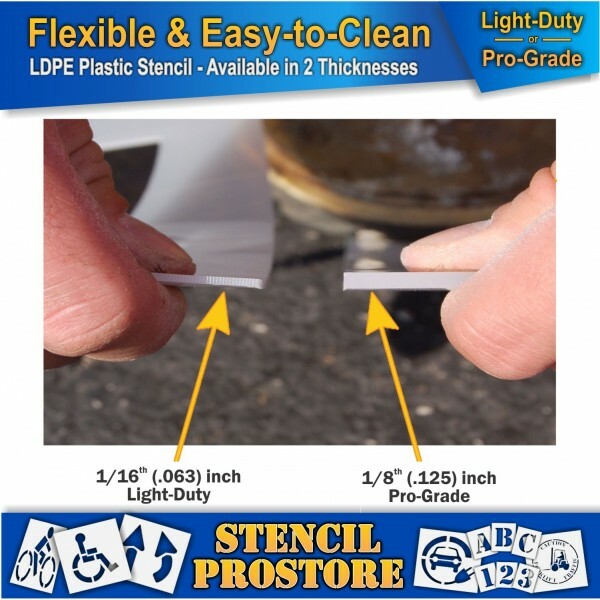 The DURO-LAST (1/16”) thickness is great for stencils that will see only occasional use, like a small business annually repainting their parking lot, while the MAXI-LAST (1/8”) thickness is great for contractors using the stencils over and over on a daily basis. 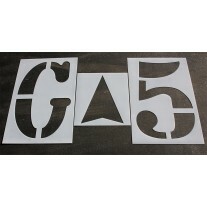 Use with any spray equipment, aerosol paints, or rollers. 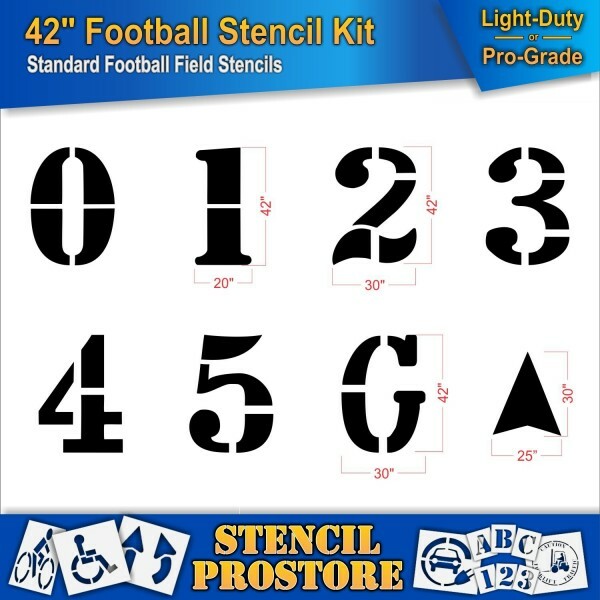 All of our stencils have between 3-4 inches of spacing between the symbol and the edge of the plastic to collect the overpray. These stencils are durable and roll-up for easy storage. With proper care, they will last for years to come. 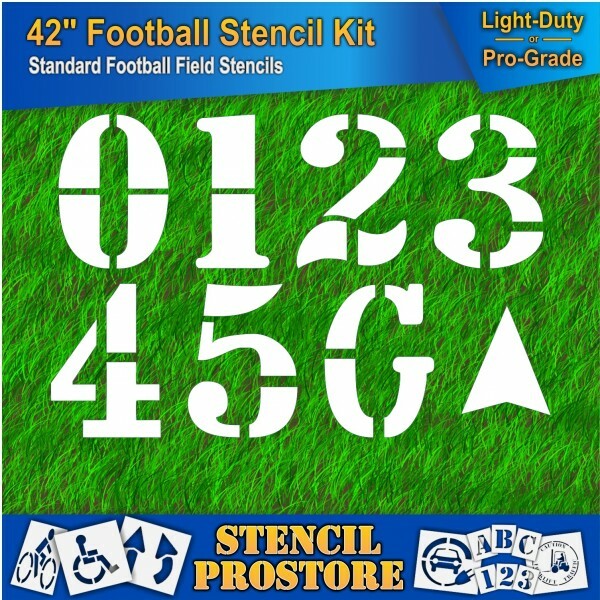 Athletic Marking - 72 inch - FOOTBALL FIELD NUMBER Stencils - (8 Piece) - 72" x 40"
Athletic Marking - 36 inch - TRACK and FIELD NUMBER Stencils - (8 Piece) - 36" x 24"
You're reviewing: Athletic Marking - 42 inch - FOOTBALL FIELD NUMBER Stencils - (8 Piece) - 42" x 30"
Athletic Marking - 36 inch - TRACK and FIELD Complete Stencil Set - (16 Piece) - 36" x 24"
Free Shipping on Graco Equipment orders over $2500.This offer is valid in the U.S. only. © RAE Products. All Rights Reserved.